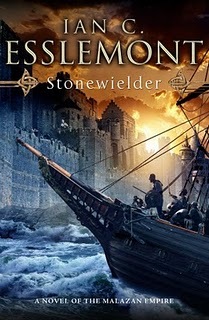 Stonewielder, by Ian C. Esslemont, is the newest book set in the Mazalan universe. It hit the shelves today, and publisher Tor has a nice excerpt to get readers interested. Unsure what the Mazalan universe is? Click here to go to the Wiki page which explains it all. It is a very complex and interesting world, and this book will hopefully add to it even more! Uli knew it for a bad omen the moment he saw it. he’d been readying his nets for the pre-dawn fishing when the unnatural green and blue aura bruised the sky. It appeared out of the lightening east and swelled, becoming more bloated with every passing moment. The bay was choppy as if as agitated as he, and he’d been reluctant to push his shallow boat out into the waves. But his family had to eat, and cramped stomachs belch no end of complaints. Just as his vision returned, another glow flashed from behind. It threw his shadow ahead like a black streamer across the bay. Turning, he gaped to see a great scattering of shards descending to the west while others cascaded on far above. He rubbed his pained eyes – could it be the end of the world? Perhaps it was another of the moons falling, as he’d heard told of in legends. He remembered his paddle; Helta and the little ’uns would be terrified. He returned to churning water with a desperate fury, almost weeping his dread. Yet not one bird. The birds – where had they gone? Run, little ’uns, run! The water comes to reclaim the land! ‘Then—’ began one of the youths. He had no idea why the damned sea-demon Riders attacked. Despite them, it was an attractive land. The peninsulas and islands were rich and cultivable. It was ready to be wholly settled but for a few ignorant native tribals. His father and his grandfather before him had fought to keep their tenuous foothold. As leader of his extended clan he had to think of the future: enough futile wandering! They would hang on to these islands and all the lands beyond. Dark Avallithal with its haunted woods had not suited, nor the savage coast of Dhal-Horn, nor the brooding Isles of Malassa. Here flew their standard. Here his forebears burned their boats. He would not allow these Riders to force them out; they had nowhere to go. Temal jerked awake, knocking aside Jhenhelf’s touch. It was almost dawn. ‘An attack?’ He struggled up on legs numb and stiff. His lieutenant’s face held an unfamiliar expression. ‘No.’ He lifted his chin to their rear, to where the grass-topped cliffs of the shore rose; to the meadows and forests and farmland beyond, all of which would soon be dead and withered should the sea-demons be allowed to work their witchery unmolested. Jhenhelf did not answer, and it occurred to Temal that the strange expression on his friend’s coarse, battle-hardened face might be awed wonder. He squinted up to the top of the cliffs’ ragged silhouette. A figure stood there, tall beneath dark clouds in the red-gold of the coming dawn’s light. The proportions of what he was seeing struck Temal as strange: whoever that was, he or she must be a giant to rear so high from so far away . . . Dawn was in full flush when they reached the crest, and when they did Will and Otten fell silent, staring. Though the shore breeze was strong, a repulsive stench as of rotting flesh struck Temal. He clenched his lips and stomach against the reek and forced himself onward alone. The figure was gigantic, out of all proportion, twice the height of the Jaghut or other Elders he’d heard talk of, such as the Toblakai or Tarthinoe, and vaguely female with its long greasy tresses hanging down to its waist, its thrusting bosom, and the dark tangle of hair at its crotch. Yet its flesh was repulsive: a pale dead fish, mottled, pocked by rotting open sores. The fetor almost made Temal faint. At the thing’s side rested a large block of black stone resembling a chest or an altar. Temal glanced out to sea, to the clear unmarred surface gleaming in the morning light, where no hint of wave-borne sea-demons remained. He glanced back to the figure. Dark Taker! Could this be she? The local goddess some settlements invoked to protect them? That many claimed offered sanctuary from the Riders? The broad bloodless lips stretched in a knowing smile, as if the being had read his thoughts. Yet the eyes remained empty of all expression, lifeless, dull, like the staring milky orbs of the dead. Temal felt transformed. She has come! She has delivered them from certain annihilation at the lances of the sea-demons!Not knowing what to say he knelt on one knee, offering wordless obeisance. Behind him Will and Otten knelt as well. Temal bowed again. The Goddess lumbered south in prodigious strides that shook the ground beneath Temal’s knees. She was gone in moments. He did not know how long he remained bowed but in time Will and Otten came to stand with him. The sun bore down hot on his back. Sighing, he straightened, dizzy. What had he done? What could he have done? No choice. They were losing. Each year they were fewer while the enemy seemed just as strong, if not stronger. But her mere approach had driven them back. ‘Well, she’s gone now – they’ll be back,’ Otten said, ever sceptical. ‘What is it?’ Otten asked, reaching for it. ‘They won’t be back. At least, not near us.’ He extended a palm to the black glittering block. Heat radiated from it as from a stone pulled from a fire. Flesh of her flesh. Good Goddess! Gracious Lady! May we never fail you or your trust. Karien’el, a lieutenant of the City Watch, led Bakune under the wharf to where the young woman’s body lay tangled in seaweed at the base of the jumbled rocks of the breakwater. The lieutenant, ever con- scious of rank, reached up to aid the man across the slippery rocks though he himself carried more years than Bakune, newly installed Assessor of Banith. ‘And this one?’ Bakune asked Karien’el. The old man knelt motionless, his face flat, carefully watchful. The body lay at his feet. Bakune crouched. Newly cast up; the smell did not yet overpower the surrounding shore stink. Naked. Crabs had gnawed extremities of hands and feet; had also taken away most of the face (or deliberate disfigurement?). Very young, slim, no doubt once attractive. A prostitute? Odd marks at the neck – strangulation. Faded henna tattoos – a common vanity. ‘No one,’ the old man croaked in thickly accented Roolian. Bakune knelt, and, dispensing with the niceties of any stick, used his own hands to shift the body. The henna swirls were old and further faded by the bleaching of the seawater, but among the unremarkable geometric abstracts one particular symbol caught his eye . . . a broken circle. A sign of one of the new foreign cults outlawed by their native Korel and Fistian church of their Saviour, their Lady of Deliverance. He tried to recall which one among the bewildering numbers of all those foreign faiths, then he remembered: a minor one, the cult of the ‘Fallen God’. ‘Drenn filth!’ Karien’el grasped the man by the neck. Iron scraped wood as his sword swung free of its scabbard. ‘We are finished here?’ Karien’el asked. His slitted eyes remained unwavering on the old tribesman. The officer descended the slope, his boots scraping over the boulders, cloak snapping in the wind. Bakune hugged himself for warmth. The coast, Lady, how he hated it: the chill wind that smelled of the Riders, the clawing waters, the cold damp that mildewed all it touched. Yet a positive review here could lead to promotion and that posting in Paliss he hoped for . . . yet another good reason for discretion. He looked for the tribesman down among the wet boulders but the man was gone. Good. He didn’t want a beating on his conscience. What an accusation! Why jump to such an assessment? True, long ago the ancient ways sanctioned such acts in the name of the greater good – but all that had been swept aside by the ascendancy of Our Saviour, the Blessed Lady. And in their histories it is plain that that man’s ancestors practised it, not ours! Thus the long antipathy between us and these swamp- and wasteland-skulking tribals with their bastardized blood. Perhaps in truth a killing by an enraged father or brother, but without sufficient evidence who can assess? In lieu of evidence the locals will decide that this one, like all those prior, was plainly the work of their bloody-handed murderous occupiers, the Malazans. From between tall boulders Gheven watched the two walk away. The Watch officer, Karien’el, lingered, searching for him. That did not trouble him; he intended to be moving on in any case. In the eyes of the Roolian occupiers of this land they called Fist he was officially itinerant, after all. And why not, since he was on pilgrimage – an itinerary of sacred paths to walk and sites to visit, and in walking and visiting thus reinscribing and reaffirming? A remarkable confluence of diametric attitudes aligning. He turned to go. With each step the dreamscape of his ancient ancestral land unfolded itself around him. For the land was their Warren and they its practitioners. Something all these foreign invaders, mortal and immortal, seemed incapable of apprehending. And he too was finished here. The seeds had been sown; time would tell how strong or deep the roots may take. If this new Assessor was true to his calling then Gheven pitied him. Truth tellers were never welcome; most especially one’s own. Better to be a storyteller – they at least have grasped the essential truth that everyone prefers lies. The occupant of the small lateen-rigged launch manoeuvred it through the crowded Banith harbour to tie up between an oared merchant galley out of Theft, and a rotting Jourilan cargo scow. He threw his only baggage, a cloth roll cinched tight by rope, on to the dock, then climbed up on to the mildewed blackwood slats. He straightened his squat broad form, hands at the small of his back, and stretched, grimacing. ‘Take what?’ the man asked blandly. The old man took up the coin, cocked an amused eye at the excise officer and tossed it back. The newcomer snatched it from the air. ‘Talk to this man,’ he told the officer, turning his back. Walking away, the newcomer allowed his mouth to widen in a broad frog-like grin beneath his splayed, squashed nose. He passed Banith’s harbour guardhouse, where his gaze lingered on the Malazan soldiers lounging in the shade of the porch. He took in the opened leather jerkin of one, loosened to accommodate a bulging stomach; the other dozing, chair tipped back, helmet forward over his eyes. The newcomer’s smile faded. Ahead, the front street of Banith ran roughly east–west. The town climbed shallow coastal hills, its roofs dominated by the tall jutting spires of the Holy Cloister and the many gables of the Hospice nearby. Beyond these, rich cultivated rolling plains, land once forested, stretched into the mist-shrouded distance. The man turned right. Walking slowly, he studied the shop fronts and stalls. He passed a knot of street toughs and noted the much darker or fairer hues of mixed Malazan blood among them, so different from the uniformly swart Fistian heritage. ‘Cast us a coin, beggar priest,’ one bold youth called, the eldest. ‘All I own is yours,’ the fellow answered in his gravelly voice. Many of the gang flinched then, wincing, and they moved off as they sensed a more profound and disquieting sacrilege flowing beneath the usual irreverence of foreigners. ‘And his second message?’ a girl asked. She had stepped closer, but her eyes remained watchful on the street, and a sneer seemed fixed at her bloodless lips. Perplexed, the girl allowed her friends to pull her on. But she glanced back, thoughtful, her sharp brows crimped. Smiling to himself again, the newcomer took hold of the door’s latch and pushed with a firm steady force until wood cracked, snapping, and the door opened. He slept that night on the threshold under his thin quilted blanket. He spent the next morning sitting in the open doorway, nodding to all who passed. Those who did not spurn his greeting skittered from him like wary colts. Shortly after dawn a Malazan patrol of six soldiers made its slow deliberate round. He watched while coins passed from shopkeepers into the hands of the patrol sergeant; how the soldiers, male and female, helped themselves to whatever they wanted from the stalls, eating bread, fruit, and skewered meat cooked over coals as they swaggered along. Eventually they came to him and he sighed, lowering his gaze. He’d heard it was bad here in Fist – which was why he’d come – but he’d no idea it was this bad. ‘I do.’ The priest reached into a fold of his tattered shirt and tossed a copper sliver to the cobbled road. ‘A worthless Stygg half-penny?’ The sergeant’s fleshy mouth curled. The sergeant swung. The truncheon slapped into the priest’s raised open hand. The sergeant grunted, straining. His tanned face darkened with effort. Yanking, the priest came away with the truncheon, which he then cracked across his knee, snapping it. He threw the shards to the road. The men and women of the patrol eased back a step, hands going to swords. The sergeant signalled for the patrol to move on. They left, grinning. One of the female soldiers blew a kiss. The priest sat back down to watch them as they went, collecting yet more extortion money. The street youths, he noted, were nowhere in evidence. Damn bad. Worse than he’d imagined. It’s a good thing the old commander isn’t here to see this. Otherwise it would be the garrison itself in the gaol. He picked up the two shards of the truncheon, hefted them. Still, mustn’t be too harsh. Occupation and subjugation of a population – intended or not – is an ugly thing. Brutalizing. Brings out the worst in both actors. Look at what he’d heard of Seven Cities. And this is looking no better. Well, he has his God. The priest’s wide mouth split side to side. Ah yes, his God. And a browbeaten and oppressed population from which to recruit. Fertile ground. He edged his head sideways, calculating. Yes . . . it just might work . . . Sitting across from his hulking grey-haired friend, Kyle squeezed his tumbler of wine and tried to keep his worry from his face. The long, stone-hued hair that had given his friend his old nickname, Greymane, now hung more silver than pewter. And though he attacked his rice and Falaran hot peppered fish sauce with his usual gusto and appetite, Kyle could see that his strained finances must be taking their toll: new lines furrowed his mouth, dark circles shaded his eyes, and Kyle swore the man was losing weight. They sat on a terrace overlooking an enclosed courtyard of raked sand where racks of weapons boasted swords of all makes plus daggers, pole-weapons and staves, as well as padded hauberks, helmets and shields. Everything, Kyle reflected, one might need for a fighting academy. So far, Kyle didn’t think Greymane, who now insisted on his original given name, Orjin, had attracted more than thirty paying bodies to his new school. Kyle didn’t count himself; he’d tried paying for all the lessons and sparring he’d been privileged to have from the man, but Orjin wouldn’t accept a penny. The three cousins who’d come along with him and Greymane had also tried to help, but after their version of ‘training’ broke bones and bloodied noses Orjin asked them to quit. Bored with hanging around, Stalker, Coots and Badlands had said their goodbyes and shipped out on a vessel heading west. Kyle’s guardian spirit, or haunt, seemed to have also drifted off: Stoop, the ghost of a dead Crimson Guardsman, one of the Avowed, those who swore a binding vow to oppose the Malazan Empire so long as it should endure. And that vow, which granted them so much, extended life and strength, also bound them in death, chaining them to the world. But over the months he too had faded away, returning, perhaps, to his dead brethren. Kyle had thought he saw a kind of disappointment in the haunt’s eyes when it appeared that last time to say farewell. So over the months he’d spent his time talking up Orjin’s school at every chance. He suspected, though, that his friend wasn’t interested in what the regular burghers and farmers of the markets, inns and taverns thought of his new academy – he had his eyes on a far more elevated, and moneyed, tier of the local Delanss society. Small chance there. Delanss, capital city of the second most populous island of the Falaran subcontinent and archipelago, boasted prestigious long-established schools: Grieg’s Academy, the School of the Curved Blade, the Black Falcon School. Academies that rivalled the famous officers’ school of Strike Island. And privately, Kyle did not believe his friend would ever manage to push his way into such a closed, tightly knit market in what seemed such a closed, tightly knit society. As far as he could see, this region’s capitulation to its Malazan invaders seemed to have amounted to no more than changing the colour of the flags atop the harbour fortress. Greymane – Orjin – tore a piece of greasy flatbread and used it to sop up the last of his sauce; he looked as though he was about to speak, but chewed moodily instead. Kyle sipped his white rice wine, thought about asking whether any classes were scheduled for the day, decided he’d better not. It seemed to him that all this must be especially galling since his friend had to hide his past. A past that would have officer hopefuls battering down his doors should they know of it. Unfortunately, word of his past career as an Imperial Malazan military general, a Fist, and subsequent outlaw from that same Empire, would have him a hunted man on this subcontinent as well. The man jumped at the bellow trained to penetrate the crash of battle, squinted up, uncertain. ‘You are the master of this establishment?’ he asked in Talian, the unofficial second tongue of the archipelago. ‘Still a boy, really . . . but rowdy. Undisciplined.’ He tilted his head as he stroked his goatee. ‘But you look as if you might be able to handle him.’ He nodded thoughtfully. ‘Yes. Thank you. Until then.’ He bowed. ‘No.’ Kyle motioned up the tunnel. ‘He’s it.’ He stood aside. The three men entered, leaving the door ajar. The indifferent condescension of that act – as if the three were used to others opening and shutting doors for them – moved Kyle to stroll along behind them, curious. He stopped in the mouth of the tunnel that led to the court. The three had met Orjin at a weapon rack. ‘You are this new weapon-master, Orjin Samarr?’ their spokesman asked in a tone that was almost accusatory. They drew, snarling. Orjin sprang upon the one on his right, the stave smacking the man’s right hand, and he yelped, tucking it under an arm. Orjin spun to face the other two. Kyle drew a wooden baton from the weapon rack, tossed it end over end while he watched. Using a two-handed grip, Orjin parried, the stave blurring, knocking the slim double-edged blades aside. The fellow in the felt hat furiously threw it aside and drew his parrying dagger. The clack of the stave against the blades echoed in the court. Kyle listened for the telltale catch of iron biting wood, but so far Orjin had managed to avoid that particular danger. The man’s face was reddening and Kyle stopped tossing the baton. Too early; far too early for any exertion to be showing. ‘They’re using knives,’ he observed conversationally. Orjin shot him a glare, his cheeks puffing. The three danced around him while he shifted slowly, knees bent, stave cocked. ‘Now, normally,’ he began, ‘none of you would have occasion to meet an opponent using a two-handed weapon . . .’ One lunged in, and Orjin’s stave smacked his face, sending him tottering aside. Orjin returned his guard on the remaining two. ‘Normally, it is too slow and awkward to move from side to side across the body. A nimble opponent should—’ The same one charged, slashing. Orjin’s stave parried, dipped, and came up into the fellow’s groin. The man fell like a string-cut puppet. Kyle winced in empathetic pain. A warning shout from Kyle died in his throat as the hand-slapped fellow re-entered the fray to grip Orjin from behind. Kyle was amazed by the foolhardiness of the move; the bhederin-like Orjin was half again as broad as any man he’d ever met. Kyle watched the big man’s chest rising and falling. Out of breath already? Not good. No, not good at all. He replaced the baton. The man shot him a glare. ‘Been a while.’ He found a rag, wiped his jowls. Kyle saluted and backed away. At dawn, Kuhn Eshen, called Kuhn ‘The Nose’, master of Rich Tidings, a Katakan freetrader, dropped anchor offshore from the town of Thickton and spent an anxious morning waiting to see whether the stories of the lands of Stratem being open once more to the outside world were true. As the hours passed the usual small boats made their way out, offering fresh fruit, bread, fish and pigs. Boys and girls swam the cold waters, offering to lead the crew to boarding houses or brothels, or to act as general guides about town. All good signs of a growing openness to trade. By noon the larger open launches were oaring out, bearing merchant agents. These men and women Kuhn greeted. He offered a taste of the Styggian liqueur he’d brought, and showed bolts of Jass broadcloth. They listened with barely concealed eagerness to his talk of Korel; news only a few weeks old rather than the two or three months it usually took for any word to reach this stretch of the isolated Sea of Chimes. One woman among them, however, mystified Kuhn and he kept a wary eye on her. She stood leaning self-contained against the side. Dressed in dark leathers, with a sword belted at her side, her long auburn hair pulled back and fixed with a bright green tortoiseshell clip, she almost looked to be a military officer of some sort. She took no interest in his wares; instead she watched his crew as they in turn eyed the thickly treed shore. Some few garbled stories had reached Korel lands concerning events on their southern neighbour. Word of a band of hireswords carving out a private kingdom. But all that had been long ago. Still, he wondered: could she be one of them? After expressing an interest in board feet of the local hardwoods, in tanned hides, and furs, Kuhn spent a time doling out news of Korel lands. The crowded circle of locals hung on every scrap – true or not. He was talking of the Stormwall when his audience went silent and all eyes edged aside, glancing past him. He turned. The woman in dark leathers had come up behind him. She was watching him expectantly, her sharp chin raised. ‘I’m sorry . . . ?’ he stammered. ‘Truly? A governor?’ Kuhn looked to a nearby agent who was nodding seriously, his thick neck bulging. Intriguing. This news could be worth much in certain ports of Korel. ‘And this governor – does he have a name?’ Closer now, he saw that she wore a single piece of jewellery high on the left of her chest – what looked like a dragon or snake wrought in silver. Best ever? My friend, I very much doubt that this muddy backwater could offer any attractions rivalling those of infamous Danig of Theft, or legendary Ebon of Stygg.